If you missed out on participating in our recent consultation on Hackney Council's Masterplan for Dalston, you've still got time to get involved. 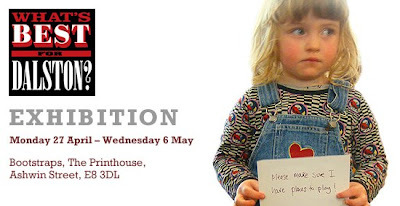 We have another special consultation day, this time in Bootstraps, at The Printhouse, on Saturday 2 May 10am - 4pm. Once again there will be volunteers from OPEN Dalston to answer questions about the proposals contained in the Masterplan. You can view maps, see what other people think about Dalston and explore issues like the scale and height of buildings, what people want from public space and how can 1,700 new houses be fitted into Dalston in the next few years? Material gathered during our last consultation day on the Masterplan has already been added. ‘What’s Best for Dalston?’ has been produced by OPEN Dalston with the help of people who live, work and spend time here who all want to celebrate and safeguard the energy, diversity and history of this vibrant neighbourhood. At the same time, the exhibition gives you the opportunity to get to grips with the key issues contained in the Masterplan, which Hackney Council are consulting on until 15 May 2009. This planning document will have a major impact on life in Dalston, as it will influence building development in the area from now on. The Masterplan identifies 21 buildings, streets and areas as ‘opportunity sites’. This means many existing buildings have been earmarked for demolition, in many cases to be replaced by bigger, higher developments. Ridley Road Market, Dalston Lane, Kingsland High Street and Ashwin Street have all been identified for major redevelopment. Several ‘opportunity sites’ are currently home to successful family shops that have been here for many years. Others contain hundreds of thriving small businesses and community organisations. Our exhibition celebrates their stories and highlights the key Council proposals for each of the opportunity sites. ‘What's Best for Dalston?’ is growing and changing, as people add their own stories, photographs, interviews, comments and ideas, so please come along and join in.